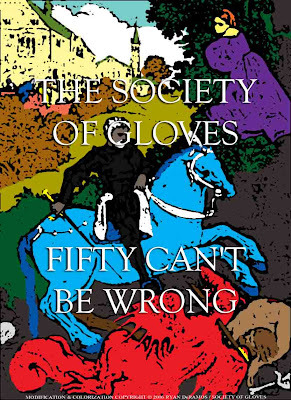 The Society of Gloves: Album Art: "Fifty Can't Be Wrong"
Album Art: "Fifty Can't Be Wrong"
This is the virtual "cover" for the second song we recorded in 2006, "Fifty Can't Be Wrong." 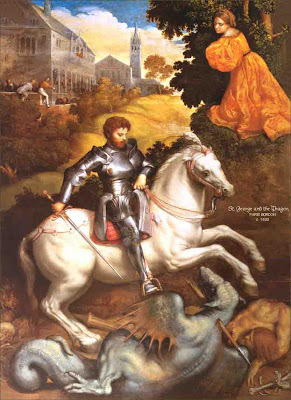 It's basically a modification of a painting from circa 1530 entitled "St. George and the Dragon," by Paris Bordon. It more-or-less fits with the subject matter of the song, if you want to stretch meanings. 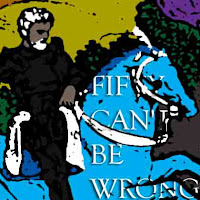 I'm not revealing anything about the song lyrics (if you've heard the song, then the literal meaning is painfully obvious), and you can read about the legend of St. George and the Dragon at Wikipedia, or elsewhere. And this is the "publicity poster" version of the cover art. There's this pseudo-continuity of the Hierophant character from "White Rhino." Does this happen before or after "White Rhino"? I have no clue, either.